This article applies to all versions of Kaspersky Endpoint Security 11.x for Windows. When creating the request to technical support, you should attach the trace file. Trace files are used by Technical Support for diagnostic purposes. They contain all steps of application commands execution written to the file and helps detect the step on which the problem occurs. 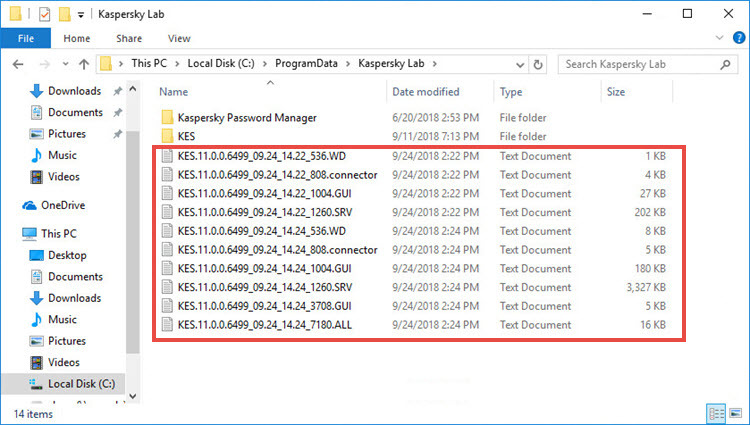 Open Kaspersky Endpoint Security 11.x for Windows. In the main application window, click Support. Is enabled , to enable tracing. With rotation , to enable tracing and limit the number and size of trace files. Enter the maximum number of trace files and maximum size for each file. Critical (100), logs critical errors only. High (200), logs all errors including the critical ones. Troubleshooting (300), logs all errors and warnings. Important (400), logs all errors and warnings as well as additional information messages. Normal (500), logs all errors and warnings, as well as additional information messages and normal operational data. This level is used by default. Low (600), logs all available messages. Ask the support engineer which tracing level to set. If the support engineer did not give you specific instructions about the trace level, select Normal (500). Restart Kaspersky Endpoint Security 11.x for Windows and reproduce the problem. Disable tracing: In the Information for Technical Support window, select is disabled in the drop-down list. Click OK. Trace files will be created in the encrypted form in the %ProgramData%\Kaspersky Lab folder. To access the folder, turn on display of hidden files and folders. Trace files have the following format: KES.version number_creation date_creation time_PID.Trace file type.log.